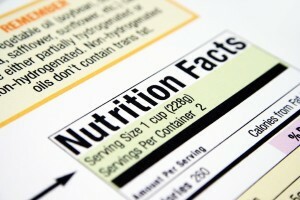 Many people struggle with reading food labels. The most successful way to read labels for better health is to not eat foods that come with a label! Although that isn’t realistic in today’s society, it makes an important point. Eat more foods that don’t come in a package, and you will be healthier. That said, you need to know how to read labels. The first thing you need to look at with any label is the serving size. Because food manufacturers want the calories, fat and sodium aspects of their foods to look “good”, they often use ridiculously small serving sizes as their basis to provide nutritional information for labeling purposes. Unfortunately, most people look very quickly at the calories and fat portion of a label and pay little or no attention to the serving size. This is a big mistake if you want to eat healthier. For example, a serving size of most potato chips is typically 1 oz, which is only about 7 chips. Most people do not open a bag of chips and eat only 7! Another good example of how deceiving labels can be is when it comes to sauces. Serving sizes for sauces is usually 2 tablespoons. Most people will consume 3-5 times that amount, adding unwanted calories, fat, and inches to their waistline. Two other aspects of reading food labels that are often overlooked are sodium and sugar, both of which can be very unhealthy when consumed in large amounts. In order to make pre-packaged foods taste good, these two ingredients are used in large quantities. Too much sodium can increase blood pressure as well as fluid retention. In fact, what most people don’t realize is that sodium is a diuretic, robbing the body of the vital water it needs. The average, healthy adult should have no more than 2,400 mgs of sodium per day, yet a single serving of supposedly “healthy” soup can have over 1,400 mgs. Brands that don’t market themselves as being healthy often have 2,000 mgs, or more, in one can of soup! Sugar is another label ingredient to watch for. Processed sugar is loaded with empty calories, meaning they provide no nutritional value yet they pack on the calories quickly. In the short-term, sugar is quickly absorbed by the body and causes glucose levels to spike and then rapidly decline. This leaves a person feeling irritable, nervous and often tired. This, in turn, leads many individuals to either reach for more sugar, or go for caffeine, which is another temporary boost to energy that leads to another drop, or “crash”. It becomes a viscous cycle, which is very unhealthy. In the long-term, too much sugar intake results in excess calories the body doesn’t burn. All unused calories consumed in any given day are stored and converted to fat. The bottom line is that in order to maintain good health and a normal body weight, you need to become conscious of labels, looking carefully at each item you buy and gravitating towards products that have a balanced and reasonable amount of calories, fats, sugars and sodium.